Please join us in celebrating the release of our recently completed artists’ book edition, Cropwork Orange– a collaboration between Robert Fichter, Bea Nettles and Denise Bookwalter. The artists will present their process of creating this book, which will be on display for viewing alongside other SCAP editions held in Special Collections at Strozier. SCAP’s current visiting artist, Jessica Peterson, will also speak about her collaborative project involving Florida artists and writers, which will be underway at the press this winter. 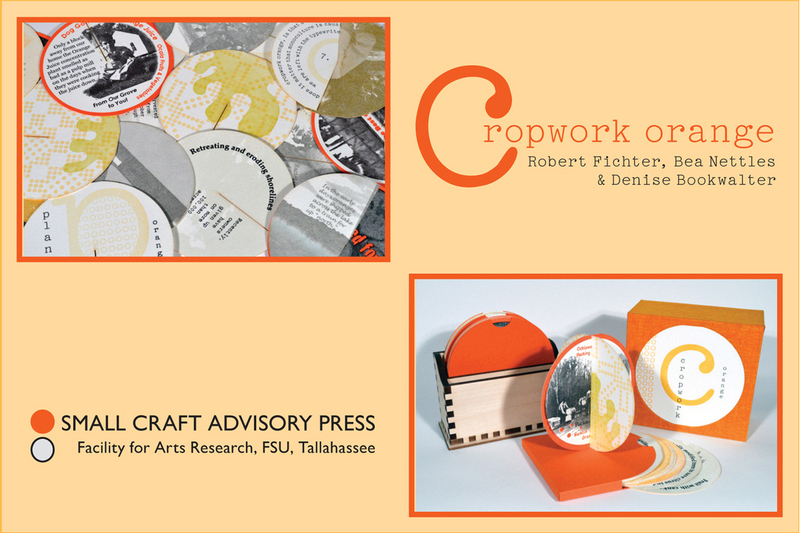 Cropwork Orange is a collaboration between Robert Fichter, Bea Nettles and Denise Bookwalter, artists with roots in Florida and a connection through teaching. The book explores the transformation of stories and information through education. Robert Fichter was Bea Nettles’ teacher, and Nettles was Denise Bookwalter’s teacher. Cropwork Orange explores the artists’ relationship to place, family, memory and information. Seventy-two modular pages combine to make thirty-six individual oranges, a full dozen from each artist. The reader physically combines the artists’ stories, memories and recollections of Florida and the Florida orange by reading the book and interacting with its circular modular pages.